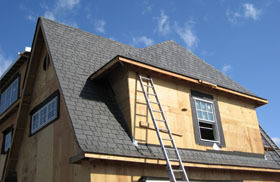 Slate roofing is one of the most beautiful, enduring roofing options on the market, but it may be out of your budget. With composite slate roofing, also called synthetic slate, you can enjoy the performance, aesthetic value and durability of slate—without the price tag. There are several ways you’ll save money by going with composite slate vs. original slate. First of all, the material is significantly cheaper. Traditional slate ranges from about $10 per square foot to over $40 per square foot, depending on which variety you choose. Composite slate, on the other hand, costs approximately $7 to $10 per square foot. 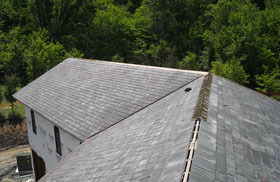 In addition to the materials savings, you’ll save money on composite slate installation — which is much easier and faster than natural slate roof installation. It’s likely that you’ll save several thousand dollars by switching to synthetic slate. Since it is not constructed of stone, composite slate roofing is much lighter. Made from recycled rubber and plastic, it’s molded to take on a “real stone” look. This eases installation, and the tiles can often be installed directly over your existing roof without putting too much stress on your New Jersey home’s structure. 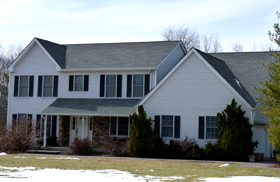 Composite slate provides a high-quality look that enhances your home’s curb appeal and architectural look. Because of this, many homeowners agree that it’s an economical, distinctive substitute for natural slate. In addition, it’s available in attractive, energy-saving colors that complement your trim, brick and siding—and reflect the sun’s heat to help you save energy. Synthetic slate is engineered to last longer than original slate (at least 40 to 60 years). It’s also low maintenance, stands up to harsh weather and is highly fire resistant. Green homeowners appreciate the sustainable design of composite slate. Made from recycled products, the tiles are also fully recyclable when it’s time to replace damaged pieces—or install an entirely new roof! If you love the look of slate but are looking for a less expensive and better performing alternative, consider composite slate. An excellent alternative to natural slate roof, composite slates offer many advantages and little disadvantages. Contact LGC Roofing today to schedule a slate roof replacement consultation, ask about composite slate pricing or compare materials with the help of our expert roofing specialists.